Fresh, simple and tasty healthy, recipes that result in stories of cooking, food and life. This cake is such a wonderful mix of textures and flavors. I gained my inspiration from Instagram, where I had seen a couple of wonderful postings of these candied orange or lemon topped Olive Oil Cakes. I wasn't quite sure what I would think of a cake made with olive oil. I have made cornbread with olive oil before, and the flavor was just a little too overpowering. I mentioned something to my mom about making a cake with Olive Oil and her reaction was, "ewww!" But actually, it is quite delicious and perfectly balances out the flavors of the other ingredients. Cakes like these are quite popular in Italian and Middle Eastern cooking, not surprising when you think about where olives grown and are in high supply. As I found from reading many recipes, often the syrup used for candying the fruit is made with honey, another typical feature of middle eastern desserts. I looked through so many recipes and read a few different blogs about making this cake. From each I gathered bits of knowledge, which I incorporated into this particular recipe that I used, from Teresa Blackburn's blog foodonfith. She altered it from the New York Times, and makes hers with Red Grapefruit. I made mine with a combination of citrus fruit, Meyer Lemons, Cara Cara Lemons and Blood Oranges. I also added in some crystalized ginger, for a little extra zing. What I think makes this recipe so wonderful is the cornmeal. It gives it a perfect heartiness, but stays light and moist with the yogurt and olive oil. I also love that it is made with whole wheat flour instead of white. I made mine in a bundt pan, but you could do it in a cake pan or as Teresa Blackburn does, a cast iron skillet. In a sauce pan, or if using a cake pan or skillet, melt the 1/2 stick of butter, swishing as it melts. Pour the butter into your bundt pan (if using one), then mix in the brown sugar and lemon juice and mix with a wooden spoon until sugar has melted. Stir in about half of the candid ginger. Set aside. Make sure that all your fruit is washed well. Cut off the ends of the fruit. Using a sharp serrated knife, slice the fruit into thin rounds. (1/8 inch or so). When all the fruit is cut, layer it into the sugar and butter mixture in the pan. I started with the lemons, as they are smaller so they would be on top of the cake, then layered on the Blood Orange, then the Cara Cara. Press them lightly into the syrup. Rub the sides of the cake pan with softened butter and sprinkle with a bit of the raw sugar. In a medium bowl whisk together the cornmeal, flour, salt and baking powder. In a small bowl, using your fingers, mix together the raw sugar and the citrus zest, really rub the zest into the sugar, so the oil will infuse the sugar. It will smell really fragrant! In a large mixing bowl, using an electric mixer, mix together the sugar zest mix and the olive oil. Mix until light and creamy. Add one egg in at a time, mixing with the mixer. When all eggs have mixed in add in the vanilla and the yogurt. Mix well. A half cup at a time, add the dry mix to the wet mix, mixing lightly each time. Don't over mix. Pour the batter into the pan. Place on middle rack of the oven. Bake for 40 minutes or until the cake is golden and spring to the touch, or when a skewer inserted in the middle comes out clean. Let cool in the pan on a wire rack for 15 minutes. Place an oven proof plate over the top of the cake, holding firmly invert the entire cake, so that it comes out on the plate. Let cool. Serve with a drizzle of plain greek yogurt, sweeter with Maple Syrup and with a touch of orange zest mixed in. Of course, whipped cream would be wonderful too. I am sure you have all heard by now, that we are enduring the great Blizzard of 2015 here on the Eastern Seaboard. Its really cold, so the flakes are tiny and the snow is super powdery. I just watched the snow plow drive by and push through a powder keg of whiteness, exposing a streak of the ground below. And here it goes again down the other side of the road as we speak. Last night the winds howled and the trees creaked in the hollowness that swirled around in the storm. The weather hype makes me laugh. I heard on the radio yesterday that this was going to be the biggest storm in history. Hey guys, don't you remember last years storm that dumped 2 feet? And the year before that it was Nemo, in which something like 40 inches fell on Boston. We live in New England, this is normal. We humans are so quick to forget history. From the small scale like a blizzard to the large scale like war and genocide, we so quickly erase such memories from our brains. I am just chomping at the bit to get this post up and turn out my Citrus Upside Down Olive Oil Cake that just came out of the oven, so that I can go out and brave the storm, run through the powder and fall into it to make a beautiful dusty snow angel. Right before Christmas, my brothers Jake and Justin both flew in to town. One from Miami and the other L.A., yes we all prefer the warmer, sunnier climates. Anyway, we had lunch at Kushiya Benkay, its a local Japanese restaurant that has great, late night sushi for great prices and is pretty tasty and affordable over all. My older brother, Jake,had been craving this veggie noodle dish since he was here at Thanksgiving, and just had to go. My younger brother, Justin, wasn't so thrilled about having Japanese food at 11:15 am, what felt like breakfast time to him. This was the precursor to a little family tension, that we all of course laughed off with good humor. As usual Justin had all his holiday shopping done, and was ready to get to our folks house two hours north. Jake however hadn't realized the convenience of online shopping, except for his girl friend's gift, which he had thought far enough ahead of time to purchase online, and even ship to our folk's before Thanksgiving. So I ended up being his shopping consultant as we zoomed across the coast for 3 hours, with all the other last minute shoppers, looking for the right gifts for people, and Justin ended up being Zsuly's babysitter in the car, indulged her in her trying to convince him that she was an elf with pointy ears and elf shoes. So to get back to the food, Zsuly loved it! 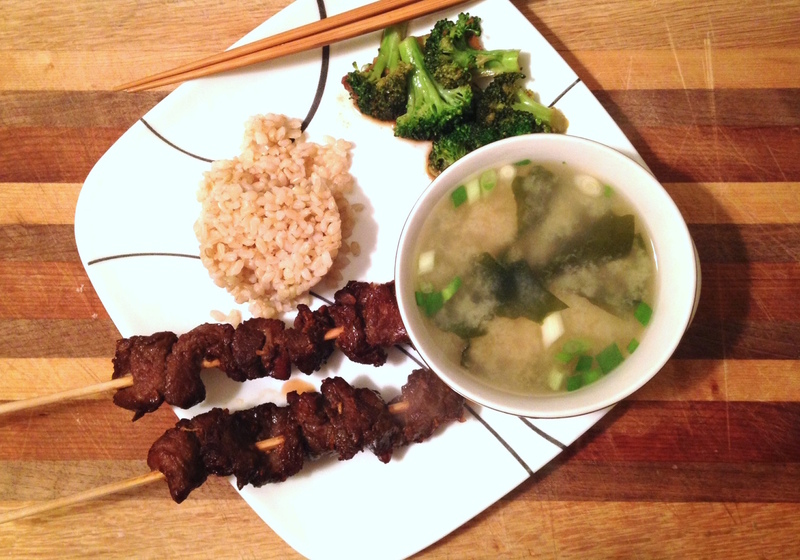 Not only eating up her chicken skewers, but finishing off my miso soup and beef skewers. The other day she asked me if we could have that soup from the restaurant again. The miso soup. I was so excited for this request, that I jumped on getting all the ingredients and browsed some recipes for ideas. So with the news of the storm, the freed up time and a bit of relief of a morning of canceled Jury Duty I scampered around among the rest of the panicked storm shoppers yesterday to get the ingredients I didn't have at home. I figured what better excuse to cook, do some baking and work on the blog than a snow day. This recipe is very simple and pretty quick. I read some recipes that called to make a Dash Stock, using Kombu Seaweed and Bonito Flakes. I couldn't find Bonito Flakes, so I just used the Kombu and some ginger. Boil 8 cups water boiled with kombu and ginger for about 20 minutes. Peel and thickly shave one carrot with a peeler. Chop the shavings and set aside. 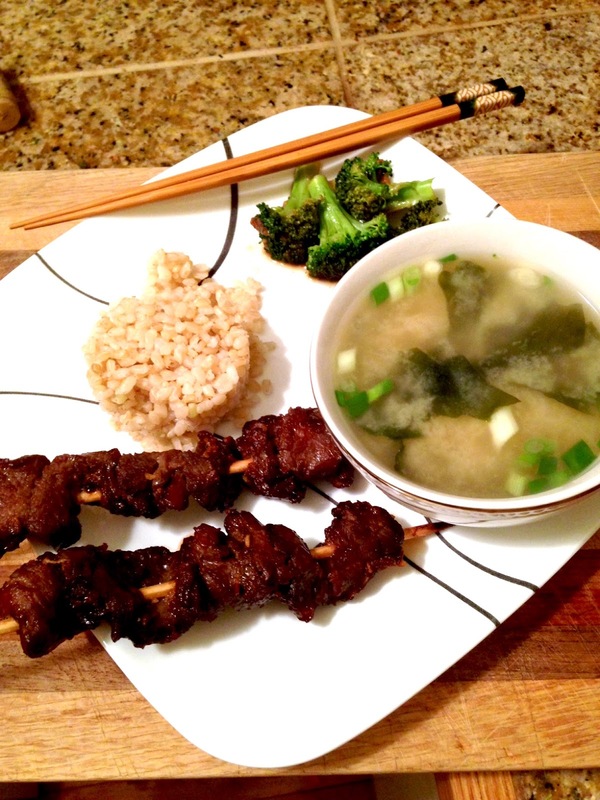 Serve accompanied with brown rice, broccoli and teriyaki beef, chicken or tofu skewers. For the broccoli and steam it first, remove most of the water, then toss and quickly cook with the remaining teriyaki sauce, stirring frequently. The recipe for the Teriyaki Sauce and the Skewers is in a separate post under meat and sauces. Marinate meat or tofu in a sealable plastic container or ziploc bag in fridge for no less than 3 hrs. Be sure to soak wooden skewers in water before using. Step 2: Remove meat or tofu from the marinade. Reserve marinade to cook broccoli in (see miso soup recipe suggestions) Skewer and broil for a total of 15-25 minutes depending on meat, thickness and temperature desired. Rotating frequently. When meat or tofu is to desired temperature or crispiness, serve with rice, broccoli and miso soup. added some canned green chili's, and some grated cheddar cheese. 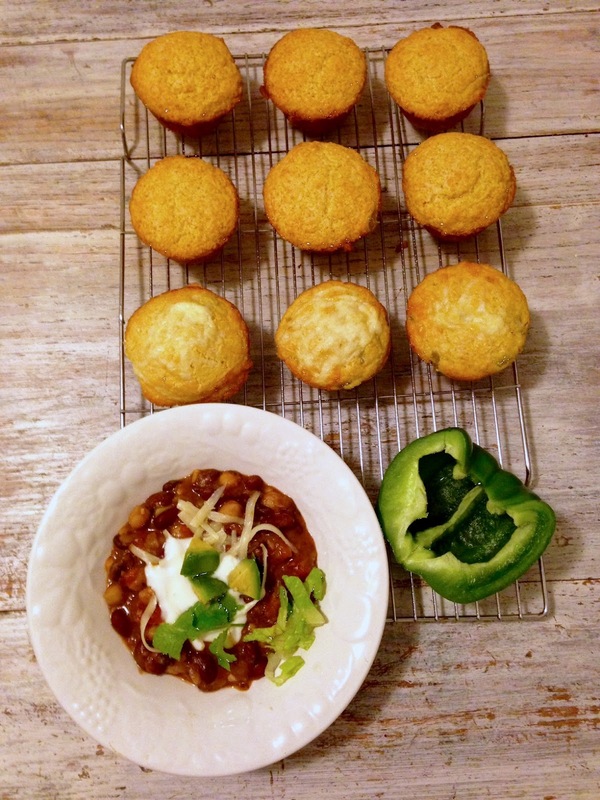 Both ways these muffins were really tasty and went so well with my Chili. Thanks to Jenn Segal at www.onceuponachef.com for this great recipe. Spray muffin tins with non-stick spray. In a large bowl, whisk together cornmeal, flour, baking powder, sugar and salt. In a separate bowl lightly whisk eggs. Whisk in honey, then milk. Mix well. Add wet mixture to the dry and then add in butter. Stir until just blended. Spoon about 1/4 batter into muffin tins. This is the point where I added canned green chilies to my batter. On top of the unbaked muffins with the chilies, I pushed the grated cheddar cheese into the middle. Bake 17-20 minutes until tops are set and golden. Cool a few minutes in the pan before removing. Serve warm. I've been trying to stay on the ball with cooking and having lots of left overs to take to work for lunch, but also to have on the evenings that we don't get home until 5:30 or later, which seems like most days. I'm sure I have said it before, I hate the cold! Last week it was so cold here in Maine that some schools were canceled. In Portland it was only 11 degrees below zero, but a little further north it was 35 below! In order to try and stay motivated to be active, I have signed Zsuly up for swimming lessons, hip hop and ballet at the YMCA. This past weekend we went ice skating on the pond at Deering Oaks Park. It was chilly! We only made it one way across the pond and back before our toes and fingers felt like ice cubes. Then there are those magic moments of winter, like yesterday. It snowed all morning and into the afternoon. It was the perfect light and fluffy snow that made everything quiet and slow. I took a short walk at Fort Williams Park in Cape Elizabeth, it was so peaceful, just what the doctor ordered to slow me down and remind me to appreciate my surroundings. Below the crunching sound my boots made in the fluffy blanket of snow, I would unexpectedly slip, falling a few times, from the slick ice beneath. But it was like meditative heaven. I could hear the muffled foghorn off the coast, the frigid waves rhythmically crashed on the shore below. I felt like I was captured in a black and white photo from forgotten times. I could almost hear the echoes of children's laughter bouncing off the stoney walls of the ramshackle mansion on the hill. I really needed those few moments to remind me of what it is I enjoy about winter. Here are a couple of recipes to warm up your chilly bones. I will post the cornbread muffins separately, please don't miss out on them, as cornbread and chili go together like coffee and cream. In a medium stock pot, sauté onion and celery until onion is translucent. Add green pepper and garlic, sauté another couple of minutes. Add beans and let simmer on medium-low heat about 10 minutes, stirring occasionally as not to burn. Add spices. Let simmer another 5 minutes. Add tomatoes, simmer uncovered for 20-30 minutes. Top with grated cheddar cheese, chopped romaine leaves, dollop of low-fat plain yogurt, sliced avocado, cilantro leaves, and a wedge of lime. Accompany with the cornbread muffins. Notes: This is plenty flavorful, but remember, I made it with my 4 year old's taste buds in mind. Too make this even more flavorful or picante, you may want to add a bit more cumin and 1/4 tsp. of cayenne pepper. You could also sprinkle with chipotle chili flakes to add heat and a nice smokey flavor. Oatmeal as a Smoothie? Thats Right! Oatmeal Smoothie/ Avena Something that Americans have been missing out on for a long time, is how to turn what so many think of as a boring breakfast food into an easy, tasty portable smoothie. When I lived in Colombia, one of my favorite breakfasts and snacks was Avena (Pronounced Avehna. The latin name for oat is actual avena sativa). It is a super common drink made from blended oatmeal, milk, cinnamon and sugar. I make mine with a banana and no sugar is needed. People make it at home, but it is also sold in yogurt sized containers in the store, with a straw. I survived on Avena during my pregnancy with Zsuly, as it was easy on the stomach and a quick filler when I was hungry and nausea was up. Whats the Deal With Oats? Why Are They so Healthy? I'm sure we have all heard of the health benefits of oats. According to medicalnewstoday.com oats can lower the risk of heart disease, blood pressure and colorectal cancer. The Whole Grains Council lists oats to have the ability to reduce asthma in children, type 2 diabetes, improve immune defenses and help control appetite. 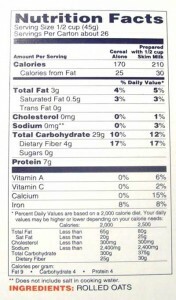 They are full of dietary fiber, as well as a number of minerals: magnesium, selenium, phosphorous, zinc, manganese, and vitamin E. Here is a label I found online for the nutrition facts of rolled oats. Blend all ingredients in a blender until smooth and creamy. You can sprinkle a tad of brown sugar on top for a little indulgence if you choose. Happy New Year to all! I hope that 2015 has been off to a great start for everyone. After keeping itself hidden for a while, winter decided to come back to us today. Last night it was as if someone was sparkling glitter from the creamy white sky. The glow of light trapped beneath the thick cloud cover, made it appear as if it was early morning. This morning, we awoke to a thick crust of ice over everything, giving the feeling of living in a fragile world of glass. Zsuly had been asking for a few days now to make banana bread, and as I anticipate difficulty with the return to work and the regular routine after 2 weeks of vacation, I am trying to have some quick and healthy breakfast available to her. Breakfast is served at her preschool, but she often needs a morning boost before that, or quickly turns into a crank monster. I love banana bread too, especially with a sprinkling of chocolate chips. However, I feel it is really important to include some whole grain nutrients in the morning, and what better place to sneak them in than sweets. I almost always sneak in some whole wheat flour in place of the full measurements of white. As our bananas weren't quite over ripe yet, I found a great tip online, that you can actually ripen bananas for banana bread, by baking them at 350 degrees. I gave it a try, I preheated the oven, set the bananas in their peels on a cookie sheet and baked them for 15-20 minutes until lightly browned. I was surprised by the amount of liquid that came out of them, and upon peeling them after removing them from the oven and letting them cool, I drained off the extra liquid. Im sure it could be used though and make and even moister bread. 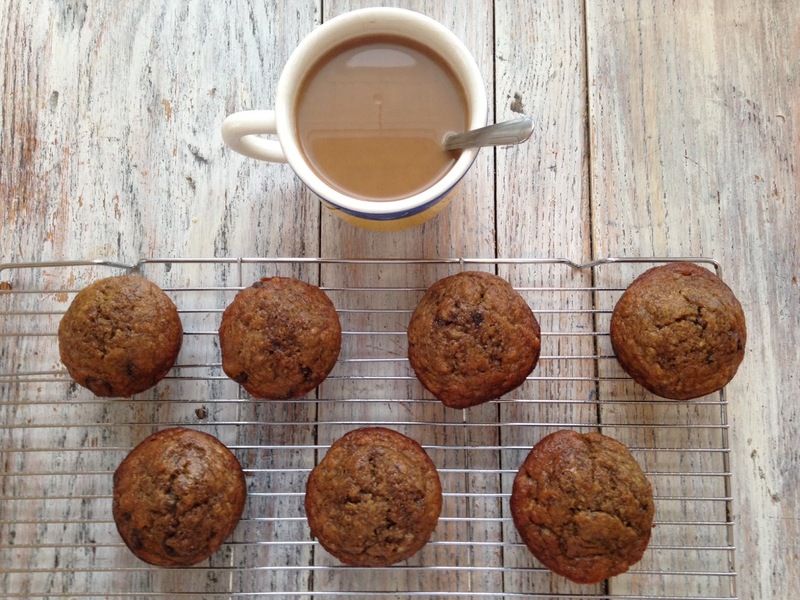 Here is the recipe for the treat we enjoyed on this cold and sleety Sunday January morning. If I hadn't been adapting to the pallet of my four year old, I would have added a half cup of chopped walnuts. ** I am updating this recipe. I wasn't perfectly happy with how it came out, so I made muffins with the recipe this past Sunday. I added more banana and cut down the sugar. They were moister and the banana flavor was more noticeable and delicious. Preheat oven to 350º and spray a 5 x 9 inch loaf pan, with nonstick cooking spray. These can also be made into muffins. I just spray the tins with non-stick cooking spray and poured in 1/4 c. batter to each one and sprinkled with brown sugar. In a large mixing bowl, sift together flour, wheat germ, cinnamon, nutmeg, baking soda, and sugar. Lightly whisk together eggs, and oil. Mix vanilla into banana and add to wet mix. Add zest and chips. Pour wet ingredients into dry, and mix until all ingredients have been moistened. Don't over mix. Pour batter into the oiled baking pan. Bake for 50 minutes, check to see if done by inserting a toothpick into the center of the loaf and making sure it comes out clean (a little chocolate is fine, but you don't want batter on it). Let cool in pan for 10 minutes. Turn out onto cooling rack and let cool another 10 minutes before slicing. For muffins bake 20-22 minutes.